In this tutorial you will use a land-surface model, SUEWS to simulate energy exchanges in a city (London is the test case). SUEWS (Surface Urban Energy and Water Balance Scheme) allows the energy and water balance exchanges for urban areas to be modelled (Järvi et al. 2011, 2014, Ward et al. 2016a). The model is applicable at the neighbourhood scale (e.g. 102 to 104 m). The fluxes calculated are applicable to height of about 2-3 times the mean height of the roughness elements; i.e. above the roughness sublayer (RSL). The use of SUEWS within Urban Multi-scale Environmental Predictor (UMEP) provides an introduction to the model and the processes simulated, the parameters used and the impact on the resulting fluxes. Tools such as this, once appropriately assessed for an area, can be used for a broad range of applications. For example, for climate services (e.g. http://www.wmo.int/gfcs/). Running a model can allow analyses, assessments, and long-term projections and scenarios. Most applications require not only meteorological data but also information about the activities that occur in the area of interest (e.g. agriculture, population, road and infrastructure, and socio-economic variables). Model output may be needed in many formats depending on a users’ needs. Thus, the format must be useful, while ensuring the science included within the model is appropriate. The figure below provides an overview of UMEP, a city based climate service tool (CBCST). 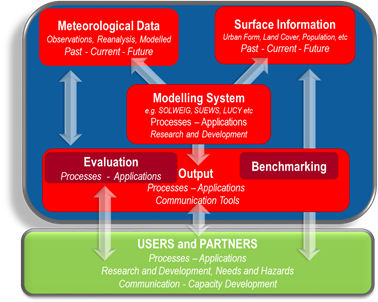 Within UMEP there are a number of models which can predict and diagnose a range of meteorological processes. In this activity we are concerned with SUEWS, initially the central components of the model. See manual or published papers for more detailed information of the model. Within other larger scale models (e.g. WRF). This tutorial introduces SUEWS and demonstartes how to run the model within UMEP (Urban Multi-scale Environmental Predictor). Help with Abbreviations. An introduction to the model and how it is designed. Details of the model inputs and outputs are provided in the SUEWS manual. As this tutorial is concerned with a simple application only the most critical parameters are shown. Other versions allow many other parameters to be modified to more appropriate values if applicable. The table below provides an overview of the parameters that can be modified in the Simple application of SUEWS. Buildings Buildings Same as the plan area index of buildings in the morphology section. Evergreen trees Trees/shrubs that retain their leaves/needles all year round Tree plan area index will be the sum of evergreen and deciduous area. Note: this is the same as the plan area index of vegetation in the morphology section. Initial conditions What is the state of the conditions when the model run begins? Days since rain (days) This will influence irrigation behaviour in the model. If there has been rain recently then it will be longer before irrigiation occurs. If this is a period or location when no irrigation is permitted/occurring then this is not critical as the model will calculate from this point going forward. Soil mositure status (%) This will influence both evaporation and runoff processes If close to 100% then there is plenty of water for evaporation but also a higher probability of flooding if intense precipitation occurs. Open SuewsSimple from UMEP -> Processor -> Urban Energy Balance -> Urban Energy Balance, SUEWS (Simple). The GUI that opens looks quite extensive but it is actually not that complicated to start a basic model run (figure below). Some additional information about the plugin is found in the left window. As you can read, a test dataset from observations for London, UK (Kotthaus and Grimmond 2014, Ward et al. 2016a) is included in within the plugin. Fig. 7 The interface for SUEWS, simple version (click on image to make it larger). To make use of this dataset click on Add settings from test dataset (see near bottom of the box). The land cover fractions and all other settings originate from Kotthaus and Grimmond (2014). They used a source area model to obtain the different input parameters (their Fig. 7 in Kotthaus and Grimmond, 2014). Before you start the model, change the location of the output data to any location of your choice. Also, make notes on the settings such as Year etc. Do a model run and explore the results by clicking Run. A command window appears, when SUEWS performs the calculations using the settings from the interface. Once the calculations are done, some of the results are shown in two summary plots. Fig. 8 Model output from SUEWS (simple) using the default settings and data (click on image to make it larger). Fig. 9 Model output from SUEWS (simple) using the default settings and data (click on image to make it larger). The graphs in the upper figure are the monthly mean energy (left) and water balance (right). The lower graphs show the radiation fluxes, energy fluxes, and water related outputs throughout the year. This plot includes a lot of data and it might be difficult to examine it in detail. To zoom into the plot: use the tools in the top left corner, to zoom to a period of interest. For example, the Zoom in to about the last ten days in March (figure below). This was a period with clear relatively weather. Fig. 10 Zoom in on end of March from the daily plot (click on image to make it larger). Use the disk tool in the upper left corner. Kc98_DailyState.txt – this provides the daily mean state (see SUEWS manual for detailed explanation). This allows you to see, for example, the daily state of the LAI (leaf area index). Kc_OutputFormat.txt – provides detailed information about the output files such as extended descriptions for each column including units. If you open these files in a text editor. To understand the header variables read the SUEWS manual. Fig. 11 Land cover fractions (click on image to make it larger). Change the land cover fractions as seen in the figure. Feel free to select other values as long as all the fractions add up to 1.0. Save the output to a different folder by selecting output folder. For more details see Kotthaus and Grimmond (2014b) and Kent et al. (2017a). The Kormann and Meixner (2001) model is used to determine the probable area that a turbulent flux measurement was impacted by. This is a function of wind direction, stability, turbulence characteristics (friction velocity, variance of the lateral wind velocity) and roughness parameters.